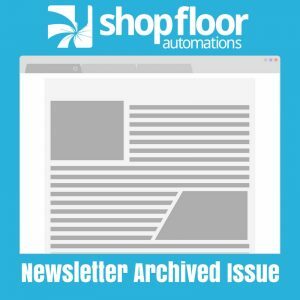 The following is an archived copy of the Shop Floor Automations Newsletter from January/February of 2014. Do you still have computers running XP in your shop? Microsoft is discontinuing support as of April 2014. You don’t want your shop to be running on a system that has no support. We can help you transition and upgrade over to Windows 7. Our team has the expertise to provide a complete, reliable hardware and software solution to keep your CNC machines up and running. Contact us today! Amy Gates, our Senior Account Executive, is taking over the daily responsibilities of our Facebook page and updating it regularly. We have noticed people enjoy seeing stories and pictures about our customers – especially in their facilities. So we started a contest. Get a chance to win a $50 gift card! Post your picture or video to our wall. Ideally, it is of you using or talking about our services or products. Each quarter this year we will choose a winner. You must “like” us to be eligible to win. Our President, Greg Mercurio, has begun a new campaign for 2014: educational videos on YouTube! View his message on this year’s campaign. Feel free to suggest topics you would like to hear about in the future. Last summer, we reached out to our community and found an opportunity to help promote San Diego veterans at a vocational training center called Workshop for Warriors. This site is a safe environment at which veterans receive vocational training, work experience, and job placements, and also have careers in manufacturing. We donated our time to help network a few of their CNC machines and serve as a resource for veterans who wanted to learn more about automation. Looking for a way to control NC program edits on the shop floor? The Predator EditLock System enables the “hardware” EditLock key switch on the machine tool to be managed using Predator DNC or Predator PDM software. The EditLock System works with any CNC control that has “EditLock” or “Memory Protect” key switch. It simply installs in the machine CNC cabinet on a DIN rail and can be externally powered via the 110vAC power supply, or directly powered via an internal 24vDC power source inside the machine cabinet.